Resource conservation is a present problem in India that will continue into the foreseeable future. Deeply rooted political and philosophical issues in India are stifling its investment in advancing conservation technology but there are some basic, everyday practices in place that are helping play a small role in saving energy. I’ve noticed some of these problems and conservation efforts during my time here in India and would like to share my thoughts. Access to clean, drinkable water is an issue that has come up multiple times during my experience in India. Our study abroad group talked about how tap water may not be safe to drink and, unlike household tap water in the USA, have pathogens in it that would get us sick. Therefore, we have planned on getting our water from prepackaged bottles that are sure to be drinkable. It is convenient and easy to buy water bottles but it is not environmentally friendly because we rack up a bunch of empty plastic bottles. 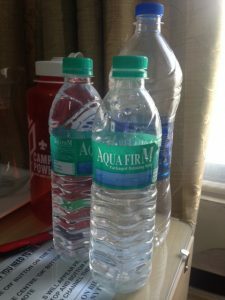 At Madras Christian College some of us noticed how much water we went through in one day – I drank up to six 21oz bottles per day. The MCC staff put out a water dispenser to refill our bottles so we wouldn’t have to take so many new ones each day. The last week we were there I roasted Steve on his plastic water bottle pile on the desk. He had over 20 bottles! Our actions didn’t seem to match our studies on the conservation of India’s resources! While at Madras Christian College, our group consumed a large amount of water from non-reusable plastic bottles. The amount of waste was embarrassing. One of the most visible issues is waste collection and waste management – it seems there is trash everywhere I look! The train ride into Chennai from Tambaram is liberating but it is a “tour de trash”. In the rivers, on the road, and on the railway are pieces and piles of trash. Dr. Anant Maringanti from Hyderabad Urban Labs led a discussion on urban waste management that followed our reading of Ciruits of Waste by Vinay Gidwani. One part of our discussion was about how there are circuits of production and circuits of consumption that intersect and flow into invisible circuits of waste. Waste is produced after consumption, but also during production, which might not be visible to consumers. We also discussed the concept of “waste” and how it is a useless byproduct of production or consumption. Dr. Maringanti claimed that waste is only waste if it has no productive use – the key is to find a way to use that “waste” item and make it a resource for another product. I don’t think there are many other uses for plastic water bottles other than recycling them into more plastic products, but perhaps in the future companies might start making water bottles out of something biodegradable. Besides the waste that accumulates from irresponsible water consumption, conservation of water is another large issue. Indians are aware of this issue, as it has plagued Chennai and Hyderabad in the past and continues into the foreseeable future. We have traveled to a few cities and stayed in various hotels or hostels. 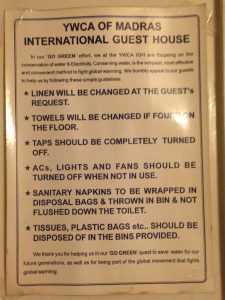 The Golkonda Hotel, Ideal Beach Resort, and the YWCA all had signs set out to remind us about “going green” and conserving water in a few different ways. The “Go Green” poster in the bathroom of the YWCA give some suggestions on how to conserve energy and water. There was a sign in the Golkonda hotel that asked visitors to save water by not requesting their sheets to be changed each day. 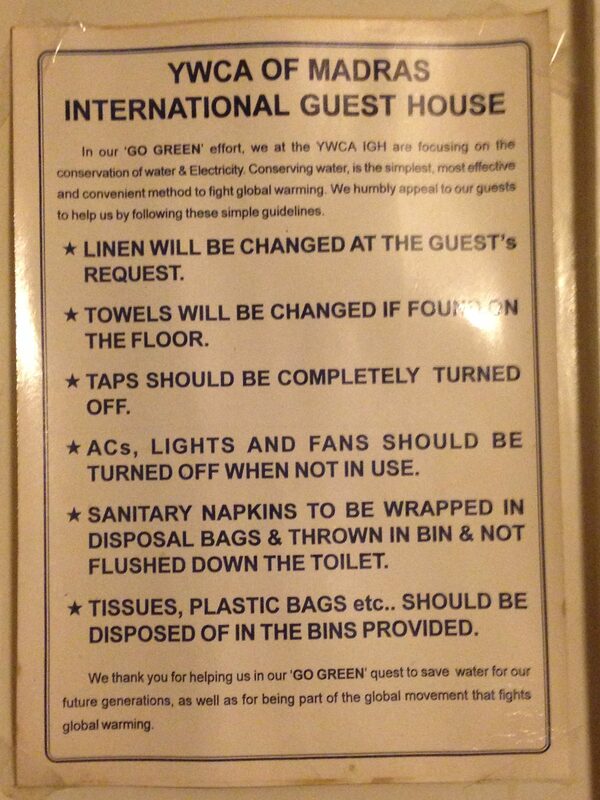 The YWCA International Guest House has a poster in the bathroom that declares their efforts to combat global warming by conserving water and electricity. It outlines what you as their guest can do to help them in this endeavor, suggesting you turn off the tap completely, turn off the AC/lights when not using them, etc. 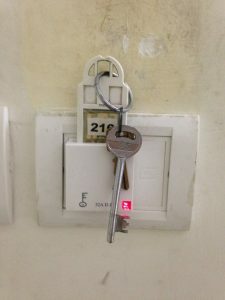 One thing I noticed in India that I don’t see in the USA is the use of the room key as a universal electricity key to the room. I wonder how well that would work back home? The universal power switch that turns controls the entire room’s power. 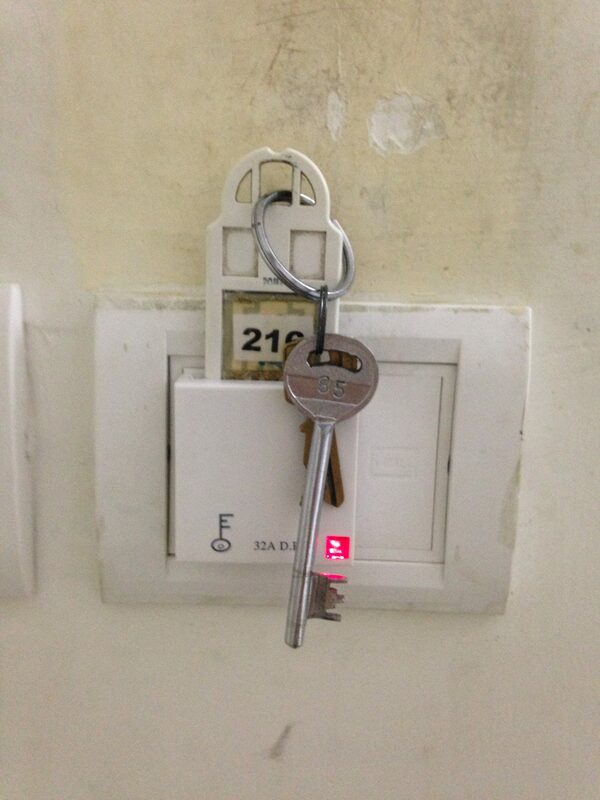 This one combines the room key with the power switch, turning off all electricity when you leave the room and take the key. Another thing I noticed in terms of energy conservation is that there are switches to turn the outlets on or off. The energy savings are probably very little and the design is most likely for safety. My mom annoys me by unplugging all the electric cords in my room whenever I leave the house but it is one way to reduce electricity usage. That said, it is more convenient to use a switch! I should refer my mother to this design! In Dr. Sulthan Ahamed Ismail’s lecture on India’s human population; Ecosystem health and human impacts we learned that, in general, 25% of household water use is for laundry and 35% is for bathroom use – which is related to another conservation practice I noticed right away in Chennai: toilets offer two flushing options. There are systems like this in the States, but they are in almost all the western bathrooms I’ve seen in India. 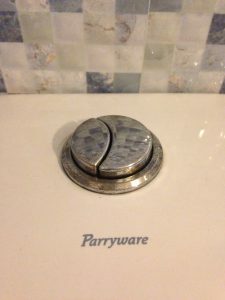 The smaller button uses less water, which you use for liquid waste, while the larger button uses more water for solid waste. There is a significant difference in water use that adds up to a lot of water saved if this system is used effectively. The flushing mechanism is intuitive: the smaller button uses less water while the larger button uses more water. Dr. Venkatachalam (from the Madras Institute of Development Studies) gave us a lecture on Climate Change and India’s Agriculture in which he described the water consumption practices of the farmers in Tamil Nadu and how they are given government subsidized electricity to pump water from their wells. This policy was introduced to aid them in times of drought and to boost the agriculture industry (a veil for gaining political influence, claims Dr. Venkatachalam) but is contributing to the water scarcity problem in Chennai. He also mentioned how the farmers are encouraged to use micro-irrigation as an efficient practice but that many resort to flood irrigation (a practice that wastes water and damages the soil) instead. I thought I saw this practice being used in the fields last week on the train ride into Chennai from Hyderabad. One of the major discussions we keep having is on the farmers’ struggles, their increased suicide rate, and their urban migration. These phenomena are all influenced by water usage and disregard for conservation practices. As an environmental ecologist, Dr. Venkatachalam gave us insight into how giving ecosystem services economic worth could possibly influence more legislation and conservation practices because it tags them with a quantifiable monetary value, making it easier to see what society could lose by neglecting an ecosystem.